Kyongmin Yeo, Youngdeok Hwang, Xiao Liu and Lisa LaVange, president of the American Statistical Association. An industrial engineering professor has been honored by the world's largest community of statisticians for his work with real-time models that help drive decision making around issues like urban air quality, extreme weather and pollution. Assistant professor Xiao Liu, along with his former colleagues from the IBM Thomas J. Watson Research Center; Kyongmin Yeo and Youngdeok Hwang were the recipients of the 2018 Statistics in Physical and Engineering Sciences Award from the American Statistical Association. Liu was presented the award at the 2018 Joint Statistical Meetings held from July 28 to Aug. 1 in Vancouver, British Columbia. The Joint Statistical Meeting is the largest statistical event in the world and attracted more than 6,500 attendees from 52 countries. The Statistics in Physical and Engineering Sciences Award is "bestowed upon a distinguished individual or individuals based on their innovative use of statistics to solve a high-impact problem in the physical and engineering sciences," according to the organization. The group's research is in the field of physics-based spatio-temporal statistical modeling and prediction. It's a field that uses real-time sensor data and fundamental physical knowledge to address key environmental concerns, such as urban air quality and extreme weather events, and to mitigate pollution and public health risks. 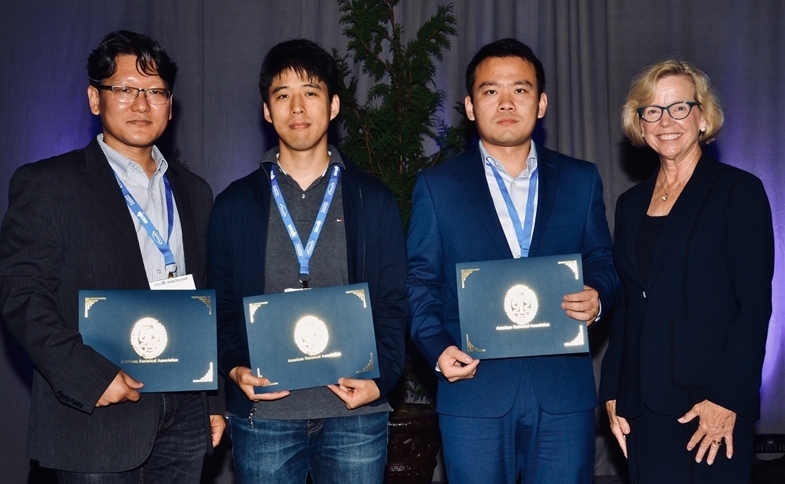 The three award winners served as core members of a series of initiatives of IBM Research on the Physics-Based Spatio-Temporal Statistical Modeling and Prediction. Liu served as the technical lead of IBM's first research project addressing environmental concerns such as urban air quality and extreme weather events. In recent years, the group's collaboration generated two U.S. patent applications and six research papers in prestigious statistical journals, including the Annals of Applied Statistics, Journal of Quality Technology and Statistica Sinica. The outcome of their research has been adopted by the collaborating government agencies and helped the public make informed choices in their daily activities. Liu joined the Industrial Engineering Department in the fall of 2017. Ed Pohl, head of the Industrial Engineering Department praised Liu's success. "This level of recognition speaks volumes about the quality and applicability of the statistical work that Dr. Liu performs," he said. "We are extremely proud of him and are very excited to have him as a member of our faculty."